Sno Con curates art benefit for us! Art Show sponsored by Sno Con. 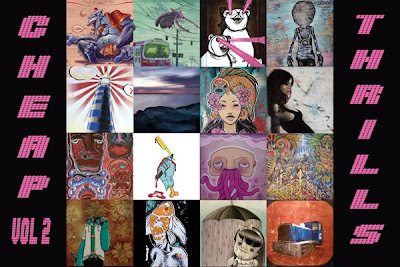 All art priced under $250. This will also be the Seattle release party for Skate Like a Girl's new zine Hate on This (HOT). Come support us! Thanks Sno Con and Shaina for coordinating! 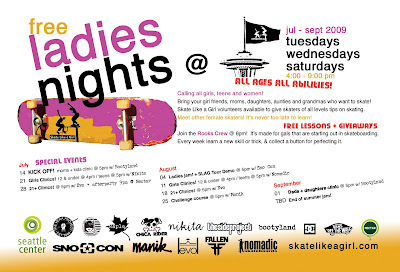 Ladies Night at new Seattle Center Skate park starting in July! Seattle Ladies + visitors! Come skate with us at the new park on Thomas and 2nd every Tues, Wed and Sat! 4-9pm-ish. Kristin Ebeling and other gals will be there to cheer you on. Come at 6pm for clinics. They are free. First come first serve. We also will have Moonie Icy Tunes there giving gals some frozen treats! Female Skate Brigade Stickers coming soon! Check this out! Kristin mixing it up with the old bones brigade graphic. Skate Like a Girl presents Bite This!, an all-ages family friendly skateboarding weekend at Seattle’s premier food and beverage showcase: The Comcast Bite of Seattle presented by Emerald Queen Casino (www.biteofseattle.com). Grab your food and Bite This! 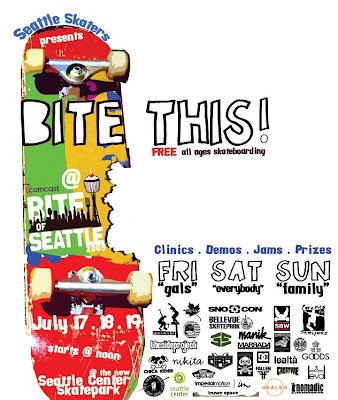 The Bite of Seattle is the first festival in Seattle to host a weekend of skateboarding in the brand new Seattle Center Skate Park. Skate Like a Girl in partnership with the local skateboard community. Community and skateboard industry providing prizes and programming include: Manik Skateboards, Snowboard Connection, 35th N, Innerspace, Skatebarn, Evo, Bellevue Skateparks, Parents for Skate Parks, and Seattle Skate Park Advisory Committee. Programming will consist of free open skates, clinics, demos, and small contests. Plus plenty of great giveaways courtesy of event sponsors. The weekend will be broken into three themes: Friday is for the ladies, Saturday is for everyone and Sunday is Family Day. Whether you are new to skateboarding, or an old pro, come munch on food while watching the pros skate the new Seattle Center skateboard park. Talented female skaters Amy Caron (X-Games Medalist), Alex White (featured in Getting Nowhere Faster), Tamara Drybrough (top female skater in Canada, placed 2nd in 2008 Chicks Flip Out), Esther Godoy (Australia), Kristin Ebeling and other gals will perform. 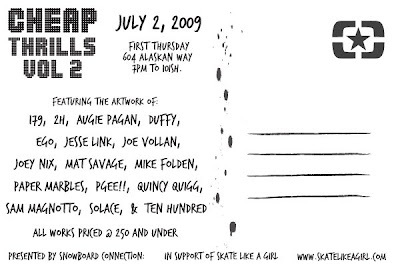 Additionally local shop skaters from Manik, Bellevue Skatepark, Snowboard Connection, and 35th N will be featured! Friday is dedicated to the ladies! With two beginner clinics, one for younger gals and another for 16+. Skate Like a Girl specializes in teaching girls and women of all ages, abilities, shapes and sizes. Skateboards and helmets will be available upon request during registration. Demos and product throws will occur all day! Saturday features a co-ed beginner clinic, demos (riders from: Sno Con, Dirty Bearings, Imperial Motion, Manik, Nomadic, and others), free skate, and two best trick contests. Sunday is Family Skate with demos and clinics provided by Scott Shinn of Parents for Skateparks and Skatebarn. Skatebarn’s Ankle Biters team will have young skaters showing off their skateboarding talent! Bite This! is the official kick-off to Skate Like a Girl summer tours: Shh.. Just Let this Happen / Winnipeg or Bust, where female skaters from all over the world will travel up and down the funnest West Coast skate spots to demo, film, and promote girls’ skateboarding. Clinic Information: Register day of at 11 a.m. for all clinics and contests. Skate Like a Girl will offer two one-hour beginner clinics on Friday. The noon session is open to girls under 16, and the 6 p.m. session will be for women 16 and over. The clinics will teach the basic foundations of skateboarding. By the end of the clinic participants should be able to have board control: balance, pushing, cruising, stopping, and turning. For those that master board control, the clinic will work with those skaters to get the feel of riding ramps, and an introduction to simple flat ground tricks; ollies, shuvits, manuals. The clinics will be taught by Nancy Chang (Skate Like a Girl co-director and 2008 L’Oreal Paris Women of Worth), Kristin Ebeling (2008 Chicks Flip Out Winner), Susannah Young (from Sweden) and Skate Like a Girl volunteer instructors. Skate Like a Girl in partnership with instructors from Bellevue Skatepark, and Innerspace will offer a co-ed clinic on Saturday. Participants will be broken into different groups based on the participant’s interest in learning tricks (i.e. beginners / rails / flat ground tricks / ramps). Skate Like a Girl in partnership with instructors from Skatebarn and Parents for Skateparks will offer a co-ed clinic on Sunday. Participants will be broken into different groups based on the participant’s interest in learning tricks (i.e. beginners / rails / flat ground tricks / ramps). The clinic suggested donation is $20 for day of registration. The clinic starts at noon and 6 p.m. sharp, all participants must come at 11 a.m. for the noon session / 5 p.m. for the 6 p.m. session to check - in. Those with skateboards and safety gear are encouraged to bring them. Skate Like a Girl will have gear for those who don’t own their own. Spaces are limited to 20 per session, so please pre-register to guarantee a spot. Bite This is open to any skater of any age and skate abilities. All participants must fill out all release forms. Under 18, parents/guardians must sign off forms. Helmets are required! We are proud to be sponsored by the following businesses, which are helping to support local skateboarders. Without these sponsors we wouldn’t be able to throw such a fun event. Please take time to check them out online.